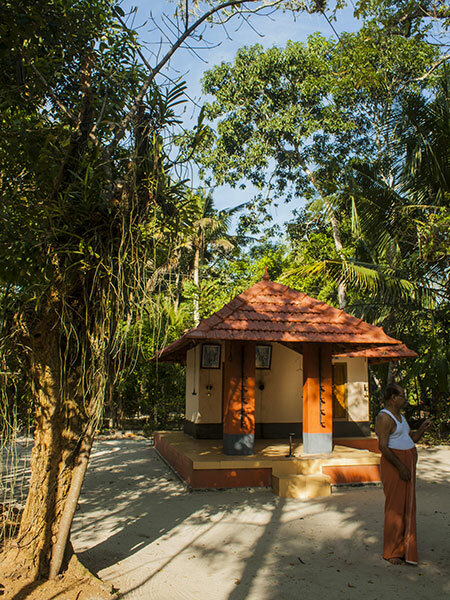 Several Centuries back the location of the present temple was a sacred Mangrove [Kavu] as per the old timers reckon .There were a number of three separate sacred mangrove [Kavukal] namely Malakavu,Guruthikavu and Pulakavu. The present temple situated at the location of Malakkavu, and to the north there was the Guruthikavu and the Pulakkavu was there in the south west part of temple. The construction of the temple took place somewhere around the 11th century CE as it is assumed .The construction of temple was related with the coronation ceremony [ Kereeda dharanam] at the Odanadu Palace, Kandiyoor Mattom. One day, two Tamil Chettipillai carrying ornaments and vessels for the coronation ceremony of the then young king, were on the way to Kandiyoor Mattom palace through Bhandarappallil Thodu near Ramapuram.As night falls, they wished to take rest for the day .They chanced to see a lamp in the woods that was the Kaavu of the present temple site. They mistook it as a house or Inn and reached there. There they saw old women beneath a peepal tree close to the attar. The old lady told them to stay for the night safely without any fear. 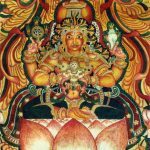 She added that she happened to be a relative of the Thampuran of the palace where the Chettipillais are going, however was homeless and used to live at that place. As time passed, both of the Chettipillais slept. In the morning, they looked around for the old woman that has seen yesterday night but of no avail. They made a conventional Vilakku offering there and set forth towards Kandiyoor Mattom palace.On their arrival at palace, they related their strange experience of the previous night to King. The king called an astrologer and conducted devaprasna and found the presence of Parashakthi[Goddess Bhavathy],the Ardhanga of Mahadeva there at the site. As desired by Devi the king constructed a temple there by replacing Kaavu. This is the legend behind the construction of Ramapuram Devi Temple. In the 18th century CE, the Kayamkulam dynasty came under the reign of the Thrippapor. After capturing Kayamkualm,Marthandavarma neglected Ramapuram temple.This was because of their several failure to subdue Kayamkulam dynasty because of the divine strength of the Sree Chakra of Bhagavathy.As a move to impose their supremacy , Marthandavarma destroyed the temple, abodes of Upadevathas.He freeze transactions of temple wealth .But after Marthandavarma,The new sworn King of Trippapoor [Travancore] Karthikathirunal was more liberal towards Ramapuram Temple .Under the leadership of Koyikkalethu Adichaman Sreekandan Kumaran, who was the then care taker of temple ,got permission to reconstruct the temple .King Karthikathirunal also given back all the right of temple to the koyikkalathe family as a part of retreat. 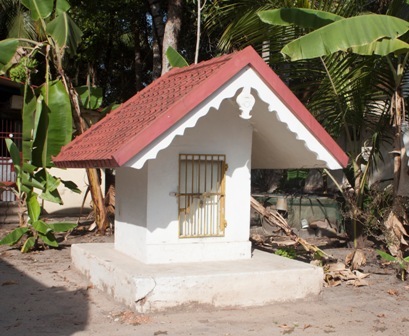 Adichaman Sreekandan Kumaran and the villagers decided to reconstruct the temple .For that, Bhattathiris of Purakkad Illom were called in to Ramapuram and rededicated the temple. The Punaprathishta [rededication] was held on 976 Malayalam Era, Karthika Star of Makaram Month. The Kayamkulam King had a small palace [Upa Kottaram] near Ramapuram temple.Since it was in front of the Pulakkavu, it was called Pulakkavu Kottaram, later on called Plakkattu Kottaram.The palace was built for the king to stay and take darshan at Ramapuram temple and also to administer his north west kalari owners. After the assassination of Vattaparambil Valiyathan, the commander in chief of Kayamkulam,Sreekandan Kumaran alias Kandankoran of Ramapuram Koikklatheu tharavadu took over charge of northwest kalaris. King marthandavarma and Dalava Ramayyan towards his northern war movement, made three unsuccessful attempt to capture Kayamkulam .Not only they can’t success over Kayamkulam,but also they account huge loss and even kayamkulam force captured kilimanoor fort of venad on a counter attack. Such strong defense were made by Kayamkulam force under Eruvayil Achuthawarrior ,who was the then minister in chief of Kayamkulam King. It got reveled in the Prasna initiated under the direction of Ramayyan Dalava that the supernatural divine power of sree chakra worshipped at Ramapuram temple was the cause of their consecutive failure to Kayamkulam. He decided to smuggle the sreechakra from temple. For that he dressed as a lunatic and tactically smuggled the sree chakra from there. In the next battle immediately broken out, Kayamkulam was lost to Thrippapoor and Marthadavarma annexed the territories to his dream land Thiruvithamkor[Travancore].Before the final war, by foreseeing the defeat by Kayamkulam king, he shifted his members and dependants to the northern countries. He visited trikkandiyoor temple and prayed,the God of his clam and reached to Ramapuram Plakkattu Palace .After dharshan at temple Adichaman Sreekandan was called in front and king instructed him to safe guard Ramapuram Temple and Bhagavathi until his return back .He sanctioned 900 and a half para of demarcated paddy field and 150 muri of land in the name of Bhagavathi in writing copper leaf .Numerous gold ornaments and metals were also presented to Bhagavathi for her welfare and set off towards the north . Kings sword and shield are kept here for the annual ritual at Ramapuram temple as part of possession. After the Punaprathishta, things were going normal. but in between, some unfortunate incidents signed and the Bhattathiris felt like the poojas and other rituals of the deity are being obstructed and even the sacred food Offering[Nivedyam] to the deity getting polluted .As it went on daily, they learnt that these obstructions was the aftermath of “ChaathanSeva” conducted by moodampadi Illom,an ancient illom near to the temple.Bringing Sreekurumba Bhagavathy from Kodungaloor and seated in the temple was prescribed as a remedial step as advised by the bhattathiris. 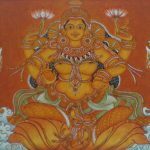 Therefore with Adichaman Sreekandan and Pichanattu family member,bhattathiri left to kodungalloor temple for a 41 day long Bhajan to please Bhagavathy .On the 41 day of the bhajan there had an oracle [Ashareeri] by bhagavathy that she had pleased by the bhajans and her presence would be there at the place soon .As a sign of presence the branch of jack tree in the south west direction in the residential estate shall break off and fall on the ground. 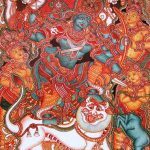 Bhagavathy further directed them to make her idol [Vigraham/Kolam] out of the jack tree branch and sanctified. The seventh day after the return of those who went for the bhajan,a big branch from jack tree in the Elayikkamuri house at the western side of the temple had broken and fell down in the nearby pond .By realizing the presence of devi, Sreekandan kumaran,the local residents of the village along with the bhattathirpad, started making the idol of devi with the fallen jack tree wood. The carpenters belongs to place outside the village were entrusted with the job and as they were doing their work, a small boy belongs to Panachamood family,who had the authority to make the temple wooden works came to the site and pointed out that the idol which was constructing now was unfit for the prathishta as it has some serious fault. After a heated dialogue with the locals and bhattathiri,the small boy pricked the idol with a chisel[Uli] held in his hand in the stomach area. Surprisingly as warned by the small boy, some stale water and a small frog came outside through the hole of the idol.With it,the bhatthathiri and locals entrusted the making of the idol to the boy of Panachamood family.Since he was blind, he made the idol of bhdrakali as per an image appeared in the mirror of his mind with the remaining jack tree wood. The kolam[Idol] got erected as per Tantric norms and seated in front of bhuvaneswari nada ,facing north .However some local people still believes that the goddess Bhadrakali of Ramapuram is the same power which was presided over the Guruthikavu situated north of temple in olden days. Jack tree in the Elayikkamuri house.Due to aging the tree is at the stage of fall down. Koyikkaleth Aadichaman of Ramapuram was one of the commandant in the army of Kayamkulam ruler in their last .In the last battle with Venadu,he met with fatal injuries and the members of the Kurava community brought him in a serious condition there at koyikkalethu family. Before the people from koyikkalethu family reach there to take care of him, he died in the hand of Aiithyas people .As he died in the hand of those untouchable ,he was let buried by them outside family. 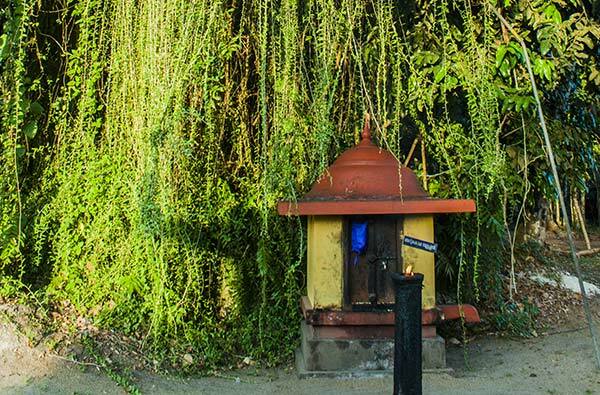 Later there formed a mangrove[Kavu] emerged there and be known as Arukulakkavu.As per a devaprasnam conducted in the temple,the ora of koyikkalathe valiyachan had been shifted inside the temple premises and seated there as arukolavaliyachan in a minor shrine .